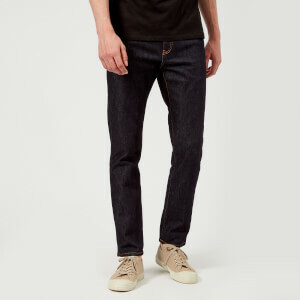 Men’s black slim jeans from Scandinavian denim label, Nudie Jeans. Crafted from comfort stretch denim, the ‘Lean Dean’ jeans have smooth abrasions and subtle 3D whiskering to the thighs for a worn-in look. 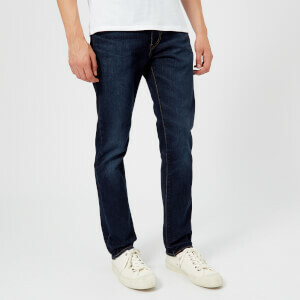 The jeans are cut with a mid-rise, and a slim leg that tapers from the thigh down to a slim ankle opening. 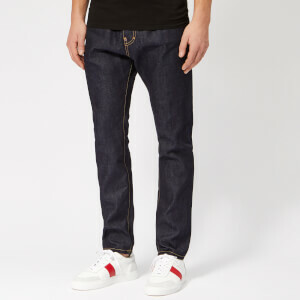 Fastened with a top button closure and a zip fly, the five pocket jeans are detailed with black topstitching, signature back pocket stitching in tonal thread and silver-tone, logo-engraved hardware. Complete with a black jacron brand patch to the rear waistband and a logo tab on the rear right pocket.